Deepak is a Happy Kuverian. A 25 year old Data Engineer, he works in Mumbai. 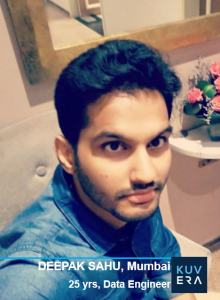 We spoke to Deepak about his experience with Kuvera, India’s friendliest Direct Plan Investment Platform. I am a technology driven person currently working as a Data Engineer in one of the top banks in India. I was born and brought up in a small town of Odisha named Berhampur. Currently am in the city of dreams, Mumbai, trying to solve problems using Data. As I come from a middle-class family we do a lot of things to save money. A few months back, I came to know about the Stock market and I am still learning and exploring that part. Meanwhile investing a huge part of my savings in Mutual fund. Also, have some emergency fund in form of FD. While doing research on Mutual fund investment, I got to know the difference between the regular and direct MF and for obvious reason I prefer direct MF. I usually bought MF from direct AMC website, but after some time I felt some difficulty to manage and track the investment. I wrote a python script to get that information for me, but due to captcha validation, it also needed some manual activities. Then I searched some on Quora and got to know about the platform like Zerodha coin and Kuvera. As mentioned in the previous question, yes I was aware of the direct plan before but failed to organize and track them. The import portfolio tab in Kuvera helped me a lot to track them. As I am a working professional, I don’t have ample time to do the required research and invest in stocks. I do it on a very small scale. I don’t want to take the risk on my hard earned capital. That’s the reason I usually invest in MFs. I am thankful that I got to know about MFs early in my life. Of course, there wasn’t a proper platform like Kuvera to invest in the Direct Mutual fund. As I mentioned earlier we didn’t have a consolidated portfolio to organize. There is no option for STP and SWP in Zerodha coin which I am using simultaneously. I am truly impressed by the import portfolio and STP/ SWP option in Kuvera. Am still exploring it, will keep you updated. I do some research on money control and value research then come to a conclusion. Planning to write a blog about it when I feel like I have enough knowledge to share. I already recommended that to my manager, will spread the words further as the most deserving candidate should get the spotlight.